Jasper Ball Snake 04 Brown White Blue Serpent Skin Crystal Spirit Animal Sphere 3.4"
Your new sphere is made from unique snake skin jasper! 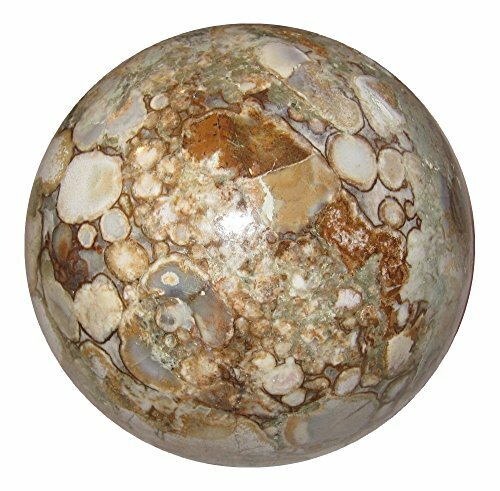 This large and mesmerizing sphere has lush spotted patterns of brown, soft blue, and white. True from the earth, it has been polished yet maintains natural lines and grooves along the surface. Bring the energy of the cunning and powerful King Cobra into your life. Receive this exact stone pictured when you order from Satin Crystals! Jasper is the Supreme Nurturer. Contains balancing grounding energy, and assists with overcoming fears and obstacles. Promotes healthy sexuality. Rhodochrosite Ball 25 Pink Spotted Leopard Pyrite Mineral Sphere Stone Spirit Animal Crystal 2.2"
Jasper Ball Snake 06 Spotted Black Crystal Healing Stone Spirit Animal Guide Energy Sphere 3.4"
Jasper Egg Green 50 Super Jumbo Crocodile Kambala Stone Plant Animal Healthy Energy Crystal 3.5"